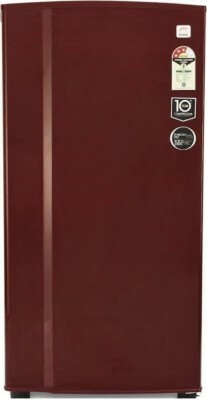 Are you searching for the best refrigerator under 15000? You are at the right place. We have compiled a list of top 10 best refrigerators under 15000 available in India as of March 2019. The refrigerators in this list have a capacity of 185L to 200L which is suitable for a small family of 2-3 members. A couple of fridges of around 215L capacity are also listed. We have tried to include only the best refrigerators from reputed brands like LG, Samsung, Whirlpool, and Godrej. All these brands make refrigerators which deliver great cooling. Most of these refrigerators have built-in stabilizer so you won't have to worry about voltage fluctuations. Most of these refrigerators have a 3-star rating which means they will consume between 200-300 units of electricity per year. Prices of these refrigerators vary from Rs 12000 to Rs 15000. In this list of best refrigerators priced below 15000, you will find 1 or 2 fridges prices little above 15000. Plus, online prices change every day so there might be a case where one of these refrigerator prices goes above 15000. We request you to check the latest price and available offers by clicking on links provided. If you can spend around 18000 to 22000 then take a look at our list of best refrigerators under 20k. Let's take a look at the best refrigerators under 15000. We have listed the main specs with a brief review and pros cons and buy links. Our favorite fridge is listed at the end of this article. Can your refrigerator play music? No? This refrigerator from Godrej can. It has an inbuilt music system which can play music from pen drive or FM. It has a mobile charger as well. So those were the extra features. The main purpose of the refrigerator is cooling and it performs that function well. It has a solid build quality which is expected from a brand like Godrej. The design of the refrigerator is beautiful as well. The floral printed design on the front door of the fridge will surely add to the look of your kitchen. There is a large vegetable tray where you can conveniently store a week’s worth of groceries in the large vegetable tray. The tray ensures proper air circulation to keep fruits and vegetables fresh. The fridge also comes with an inbuilt stabilizer and it can operate from 140 to 260V. All these features make it one of the best refrigerators in India under Rs 15000. This is a gorgeous looking single door refrigerator from Samsung. It is a latest refrigerator and was launched for 2019 summer season. The capacity of the refrigerator is 192L and is suitable for a small family of 2-3 members. The energy efficiency rating is 4 star which means you get great savings in electricity bills every month. It will consume around 160 units of electricity every year. The fridge has a Grande Door Design where a fine line is placed towards the bottom of the door gives it the appearance of a double-door design. This design element enhances the look of the refrigerator. It also has an Island-type Handle which makes it convenient to open and close the door of the fridge and also adds a touch of elegance and minimalism to its appearance. Overall, with this floral print and chrome door handle, the refrigerator looks gorgeous. The fridge has a digital inverter compressor which helps in providing better cooling and also increases the life of the compressor. It also has a solar connect technology with which you have the option of running it directly on Solar Energy. This lowers the amount of your electricity bill and your carbon footprint as well. There is a 1-year warranty on complete product and 10 years on the compressor. Samsung has a really strong after sales service network so you won't face any issues. Gorgeous design, excellent cooling and plenty of features make it one of the best single door fridges under 15000 in India. So this was the list of best refrigerators under 15000 available in India. We hope that the list was helpful in making a decision. If you have any questions or doubts regarding which refrigerator you should buy then connect with us on Facebook. If you are still confused and thinking about which one you should buy then go with our favorite listed below. Our Favorite of this list is the Whirlpool 200L Refrigerator. Whirlpool makes some great refrigerators and this one comes with a good 200L capacity, super design, and an inbuilt stabilizer. Plus, you get a 10-year warranty on the compressor and Whirlpool has one of the best after-sales service networks across India. It will cost you around 14000 and 15000 Rs. Our next favorite is LG 190L Refrigerator. It also has a good capacity, a beautiful floral design on the front, inbuild stabilizer and excellent after-sales service.